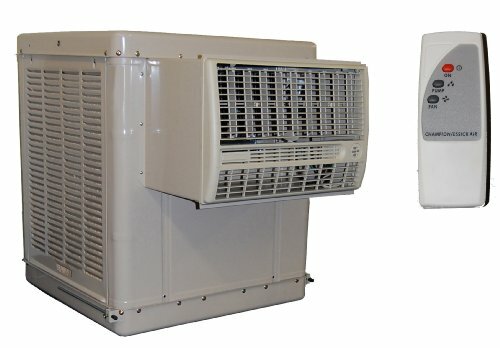 This American built window evaporative cooler has been engineered to provide cooling comfort for spaces up to 900 square feet. Designed for both optimal airflow and superior durability, this energy efficient cooler provides years of dependable, worry free, cooling. Each cooler must meet strict quality control standards and pass a rigorous performance test prior to shipping. The bolted construction not only provides easy access for part replacement, but it also eliminates welded seams for rust prevention. This cooler arrives complete and ready for installation. Evaporative coolers perform best in dry, arid climates. Essick Air is a registered trademark of Essick Air Products. WARNING: This product can expose you to chemicals including benzene which is known to the State of California to cause cancer and birth defects or other reproductive harm. For more information go to www.P65Warnings.ca.gov.